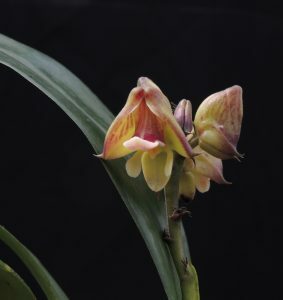 This stately orchid has the typical features of a polystachya flower; it is non-resupinate (up-side-down), has large lateral sepals that form a hood, and has flowers that open in succession on a flower spike produced from the base of the single leaf that grows on a cylindrical pseudobulb. The flowers are really worth a close look from underneath as this reveals the beautiful combinations of cream, green and red that are hiden from above. Like most polystachyas this species is African and is found in Cameroon, Congo, Gabon, Ghana, Guinea, Ivory Coast, Liberia, Nigeria, Sierra Leone, Zaire and Angola. The broad distribution results in a wide range of colour forms. The species is native to hot lowland evergreen forests from 400-1000m altitude and so we grow plants in our Warm Asia section (we don’t have a Warm Africa section) in shade with a minimum of 17C.